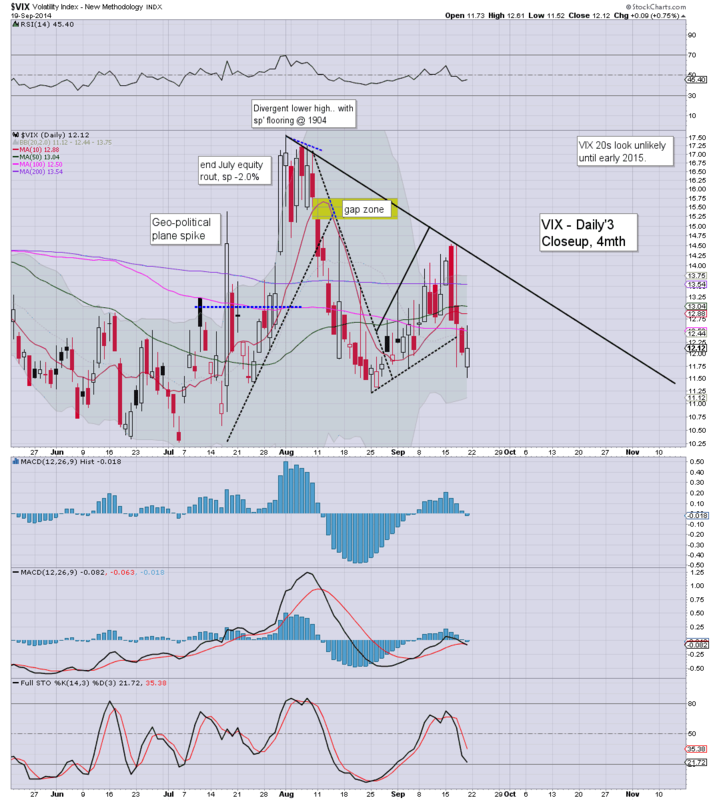 With US equities closing somewhat mixed, the VIX held onto fractional gains, settling +0.7% @ 12.11. 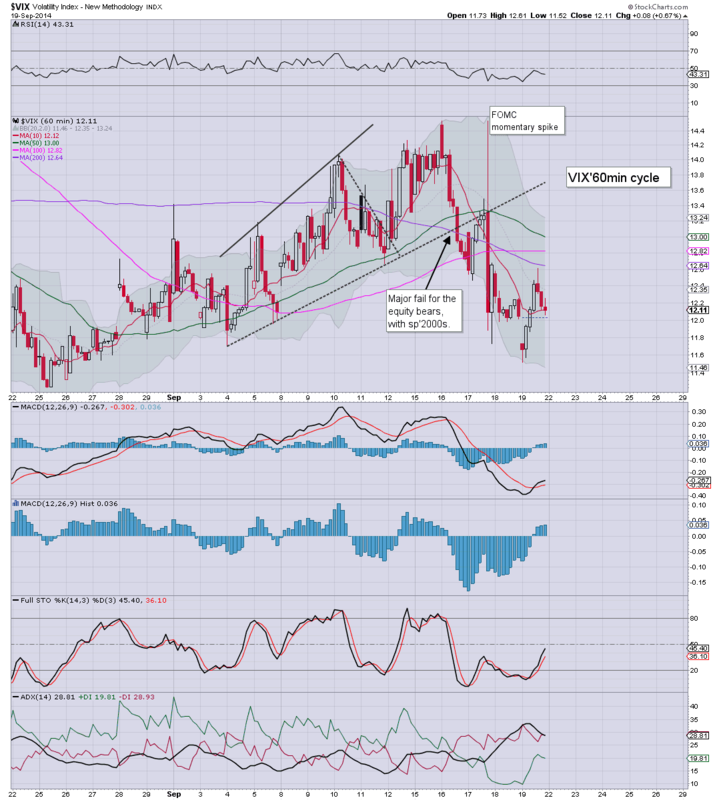 Near term outlook is for the VIX to remain within the 14/10 zone. Across the week, the VIX declined by a rather significant -8.9%. Suffice to say, for the equity bears it was rather lame that the VIX didn't even make it to the gap zone in the 15s this week. 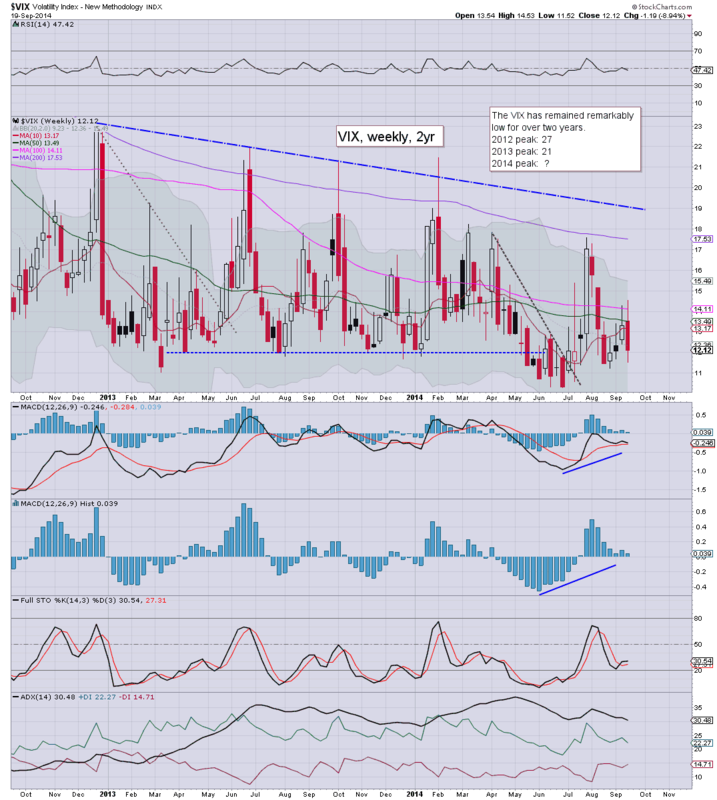 There looks to be little possibility of VIX 20s for some months. US equities closed somewhat mixed, sp -1pt @ 2010. The two leaders - Trans/R2K, settled lower by -0.5% and -1.1% respectively. Near term outlook is for continued broad market upside to the sp'2030s. ...and that concludes another bullish week in market land. There really isn't much to add. We're continuing to broadly climb from the recent sp'1978 low, and look set for the 2020/25 zone early next week.. with 2030s by end month. *I hold long across the weekend, seeking the 2020/25 zone next Monday, with a broader target of the 2030s by end month. Caldera continues to fall... eventually Bardarbunga still looks set to blow up.... although I guess many have been saying the same about the equity market for some years. Its been a long week... thank the gods...its almost the weekend! *I remain long, but if we can jump to 2020 by the close, I will probably exit for a day-trade..and would just re-long again on Monday. Regardless, the broader trend remains strongly higher. 3.19pm.. market appears in slow melt mode..to the upside. The 2018/20 zone remains viable by the close, but still... more likely early next Monday. 3.35pm chop chop...2010 should hold....moderate chance of 2015/16. On any basis though.. a week for the bulls. 3.50pm... CNBC... NFL crazie 'don't take me to an elevator'. US equities appear to have floored at sp'2006, with a VIX of 12.61. With the USD continuing to build gains, +0.5% @ 84.75. the metals are battered, Gold -$10, with Silver down a severe -3.7%. *I remain long from sp'2011... certainly, didn't catch the low, but it'll suffice, with a target of the 2030s.. very viable next week. Looks like a pretty standard retrace... the 2020s look a very reasonable target in the next up wave... on Monday. So...two hours to go..and frankly...I'm tired. 2.01pm.. .. only just noticed the R2K, -1.3%... hmm, not sure what to make of that, other than the usual 'laggard'. US equities are seeing some minor chop, having cycled down from sp'2019 to 2009.. a soft decline of around 0.5%. There looks to be renewed upside into the close, but it will likely be somewhat choppy.. since it is quad-opex. *I am long-index, from sp'2011. 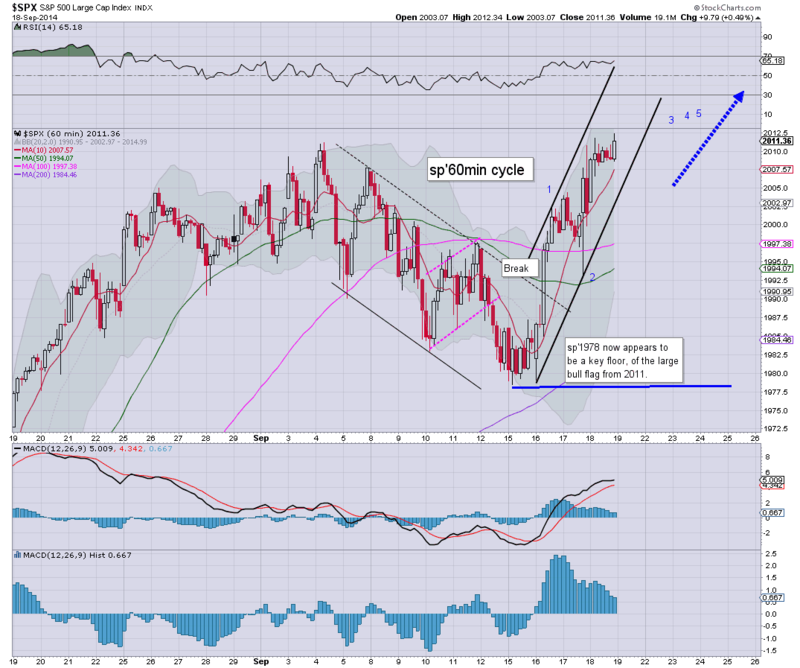 Unless we jump sig' higher into the close (>2020), I will hold across the weekend. 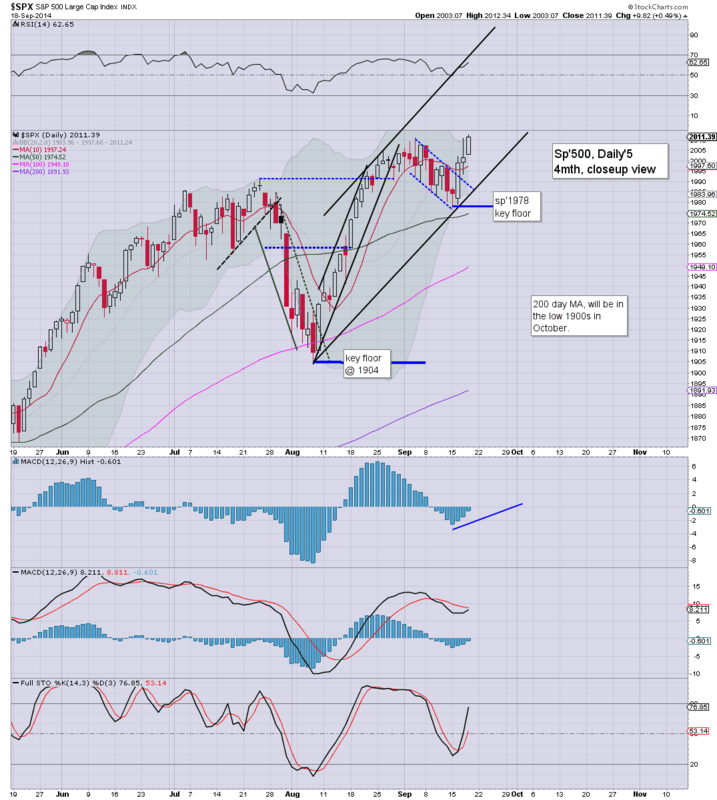 Seeking the 2030s.. as supported on the bigger weekly cycles. 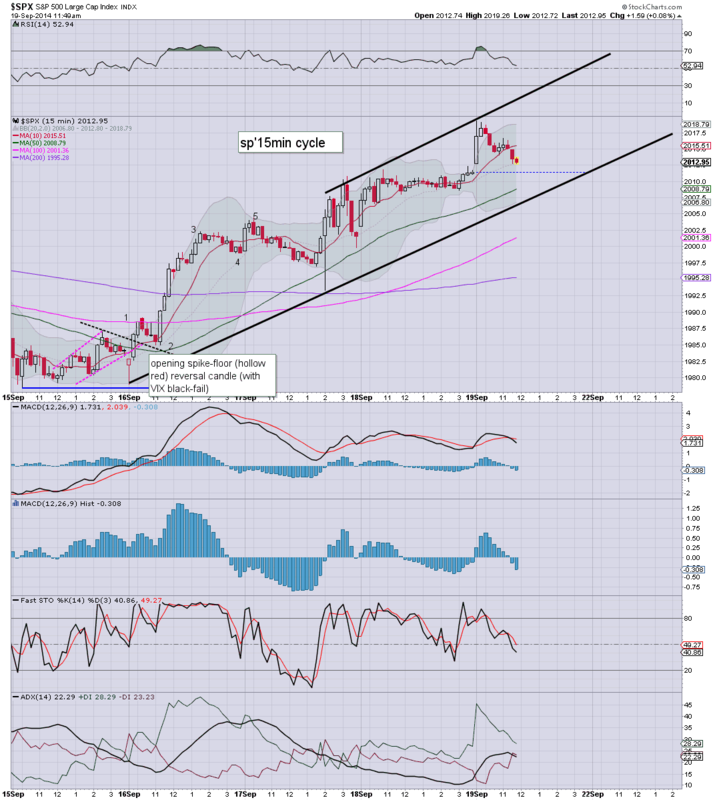 MACD cycle on the smaller 5/15min cycles look floored. Certainly, I think its a valid level to go long.. - when considering the broader trend. time for a walk...between the storm cells.... back soon. US indexes have continued to slip a little, but it makes for a very natural down cycle from a trio of new historic index highs. Metals remain smashed, Gold -$5, whilst is down a rather severe -2.8%. *I remain on the sidelines, but might pick up an index block...once the smaller 15min cycle looks fully floored. 11.58am... Truly incredible...BABA $98...and headed for the giant $100 threshold. 12.09pm... indexes turning red... another bit lower..and I might be a buyer. 12.13pm.. LONG from sp'2011. The smaller 5/15min cycles look pretty low.. my target will be 2030s next week. Will likely hold across the weekend, unless 2020 at the close. *those metals sure are ugly... but frankly, after 3 years, I merely laugh at the insanity within the gold bug community. Just consider that so many are STILL touting Gold $2000 by year end.. and the truly insane (yeah, I'm talking about YOU Mr H. Organ) are touting 10k...within 3-4 months. meanwhile...over the city of a London, storm clouds are exploding upward. If I drop offline, well, then you know its a lightning strike! 11.22am.. BABA looks set to open in the 90/95 zone... the big $100 threshold looks easily viable by the close. On a strictly earnings perspective...given a year or two.... change the 1 for a 'giant 2' handle. 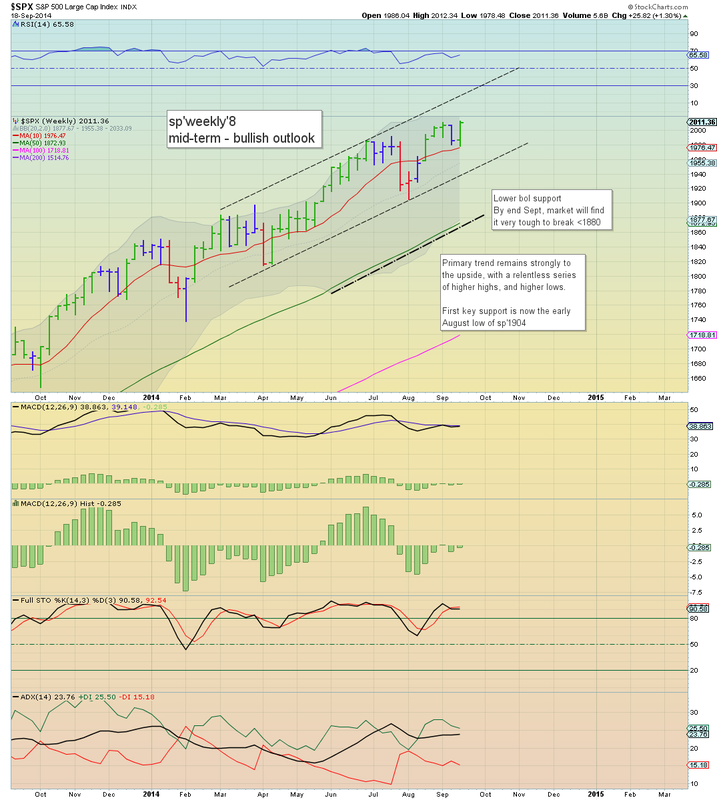 US equities open moderately higher, but it is more than enough to achieve new historic highs in Dow, SP', and Transports. VIX is in melt mode, -3% in the 11s. With the USD +0.3%, the metals remain weak, Gold -$3. 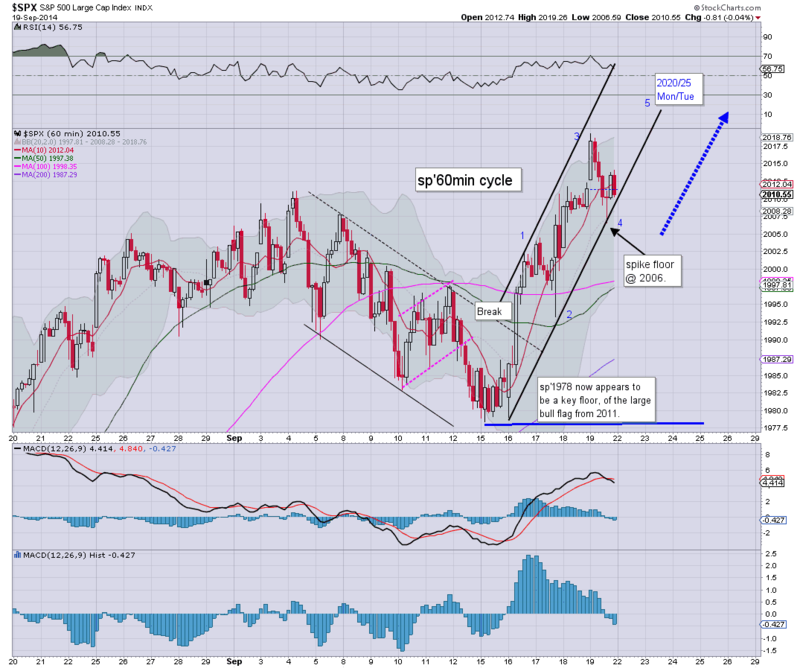 Without getting lost in the minor noise, the weekly charts are now offering the mid 2030s. By end month, we're now looking at the 2040s. Whether the market gets stuck around 2050..or can just keep grinding to the 2100s - into Christmas.. difficult to say. What is clear though.. this is no market for the bears.... trend remains strongly higher. Notable weakness: oil/gas drillers, SDRL -1.9% in the $29s... next support is around $26. Certainly, it is a stock I will be closely following in the days..and months to come. Metals continue to slide, Gold -$5.... with Silver well under the 2013 low. 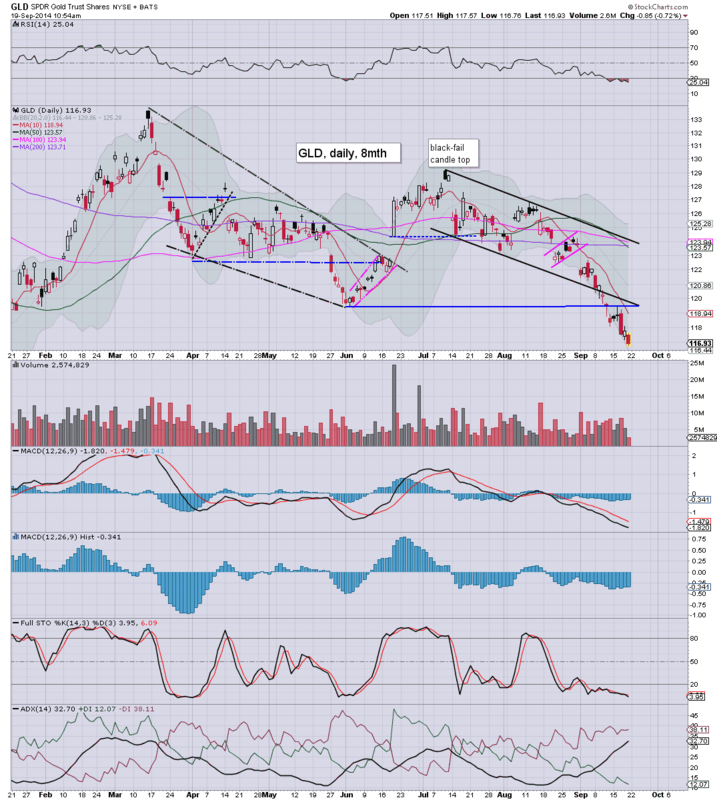 Miners suffering, GDX -0.8%.... a long way down yet to go though. 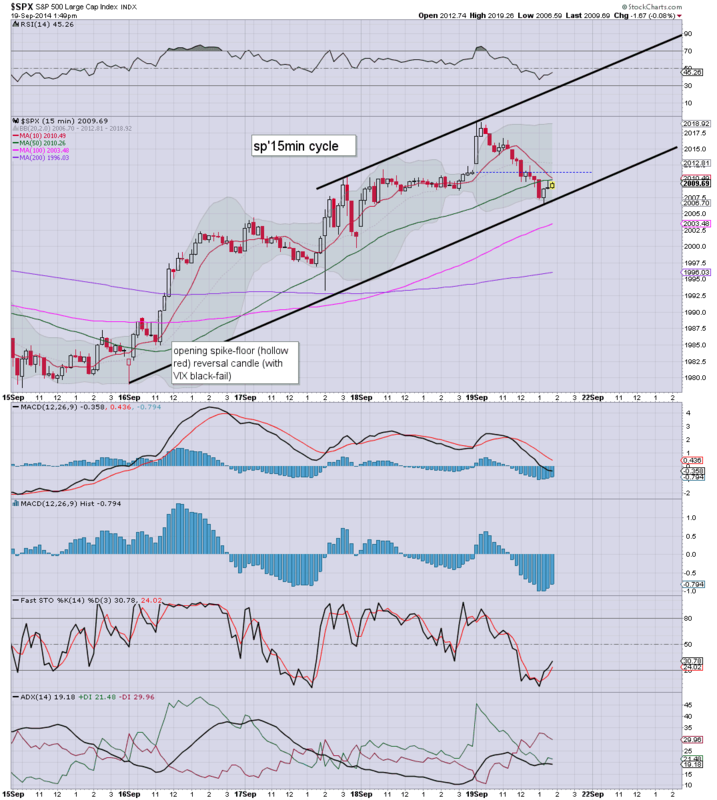 sp'2008/06 viable within an hour or so.... would be a valid entry level for those seeking to trade into the 2030s. Good morning. Futures are moderately higher, sp +7pts, we're set to open at a new historic high of 2018. 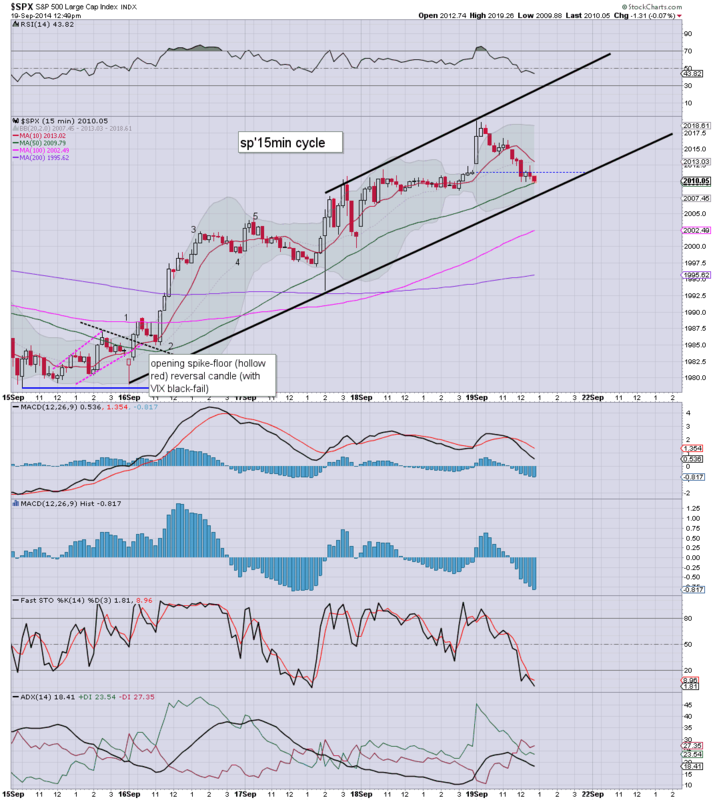 Metals are a little weak, Gold -$3. Today will largely be about a very relieved European equity market, along with the giant Alibaba IPO. So... we're set to open at new historic highs... probably in the Dow, SP, and Trans. It is notable that today is a quad-opex, along with an index rebalancing.. so expect some price chop.. especially into the close. Hourly MACD (blue bar histogram) cycles are due to rollover, with a bearish cross today, but still, prices will probably just flat line... holding moderate gains into the weekend. Well, I think many are genuinely surprised at the 'NO' vote, I certainly am. For a few centuries, the Scots have endlessly whined and bitched about how they are under forced rule by the English (not forgetting the Welsh or Northern Irish)...and yet they have voted against self rule. There will be some more 'localised powers' for the already existing Scottish parliament, but still.. they'll be largely under rule of those in southern England. For those in Catalonia, Spain, I can only imagine how many are feeling pretty depressed this morning at the failure of their fellow separatists, but they'll surely continue to push hard to get their own vote. 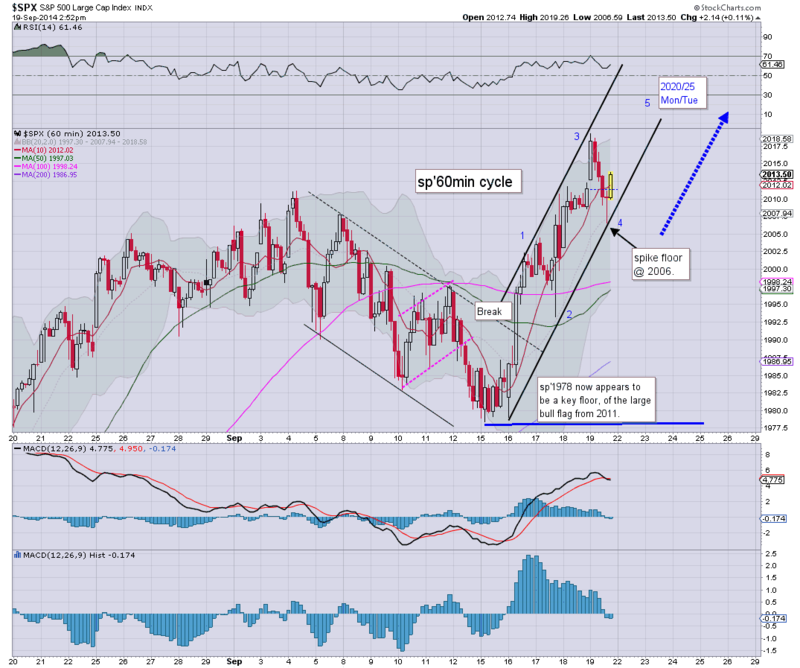 Whilst US equity indexes saw a third day of gains, the real action is in North West Europe. where Scotland may break away from the United Kingdom.. it would make for one hell of a geo-political event.. one that will have implications across the wider EU.. for years to come. *I'm writing this before the Scottish vote result is clear. 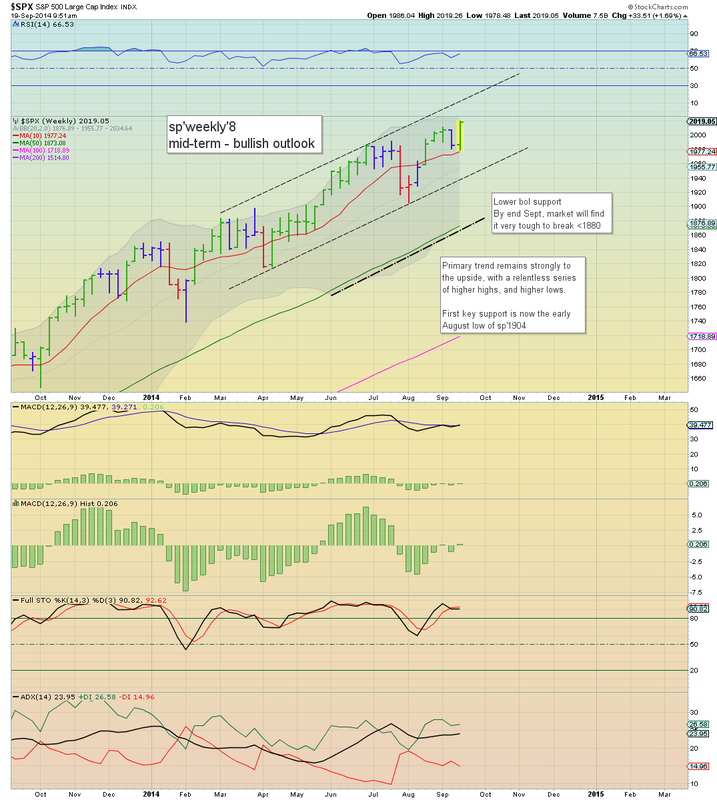 In terms of the equity market, the broader upward trend is really asserting itself, with new historic highs on the Dow and sp'500. The weekly 'rainbow' chart is sporting an outright bullish green candle. 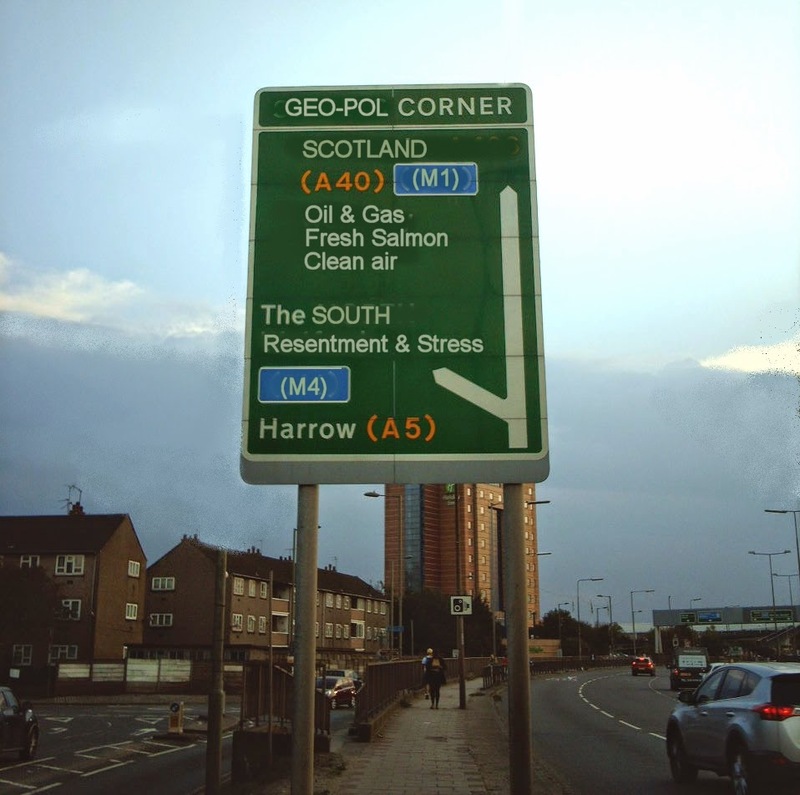 The 2030s look viable in the immediate term, with 2050s in October. The only econ-data due is 'leading indicators', but I don't think many will have much interest in that tomorrow. The giant Alibaba (ticker - BABA) IPO is set to be traded.. will likely open at least in the $80s... and I'd not be surprised if it hit $100 by the close of its first day. There is also a quad-opex, with some index rebalancing to wrap up the week. 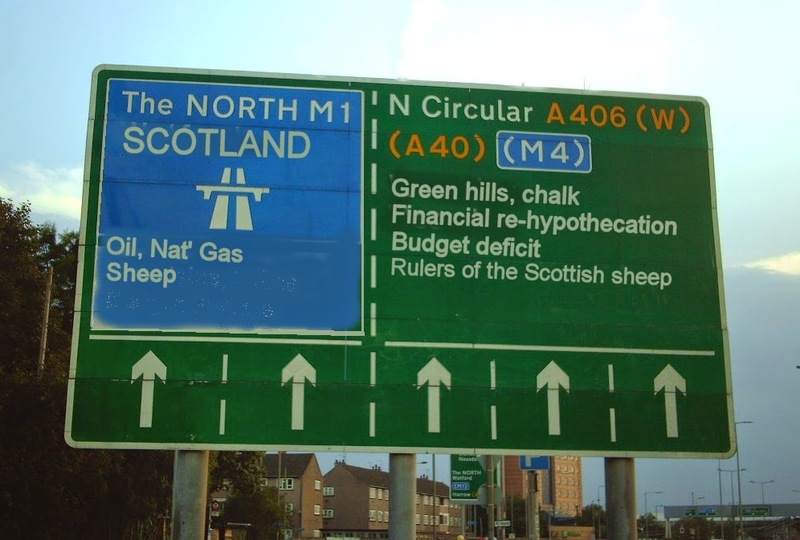 I realise for many in the USA, the issue of Scotland leaving the UK is of little importance. Frankly, most Americans couldn't put a pin on a map to indicate the rough location of Scotland. However, the implications are pretty huge. A successful Scottish breakaway would deeply inspire various factions across Europe to relaunch the efforts for more localised government. Catalonia, in Spain, remains a real hotbed of contention for southern Europe. Without doubt.. many Catalonians will be watching UK TV this night... cheering on a 'YES' vote. US indexes clawed higher for the third consecutive day, sp +9pts @ 2011. The two leaders - Trans/R2K, settled higher by 0.3% and 0.5% respectively. Near term outlook is bullish into the sp'2030s. 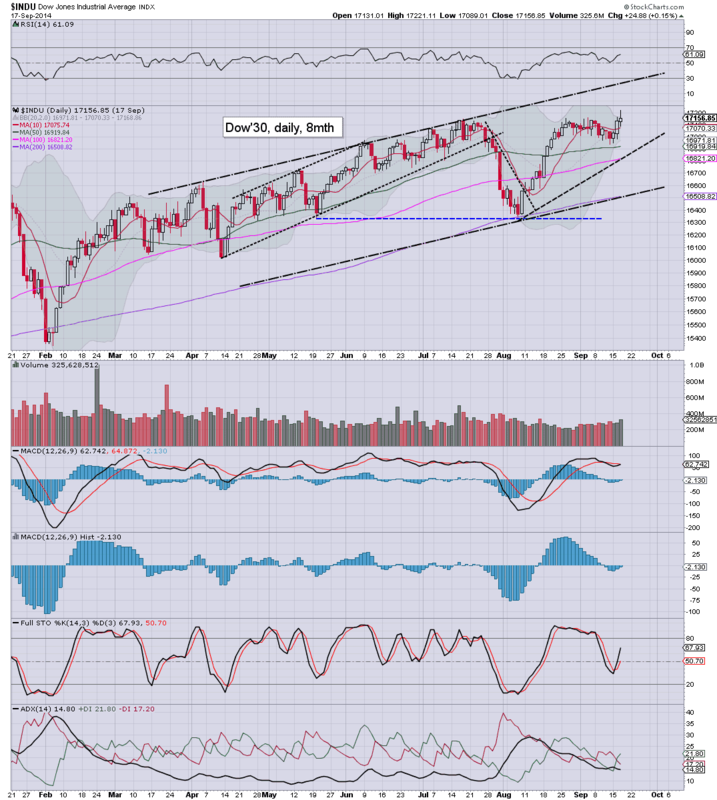 With new historic highs in the Dow and Sp'500, this remains a powerfully bullish market. There really isn't much else to add.